Over the next two or three entries I'm going to provide summaries of activity represented on some of the mail-lists most relevant to the development and use of audio software for Linux (and other platforms). I'm subscribed to a variety of such lists, and it occurred to me that a summary of their traffic would be a good indicator of the breadth and depth of our corner of the larger Linux world. I'll proceed through my lists in loose alphabetical order, starting with news from the Ardour camp. 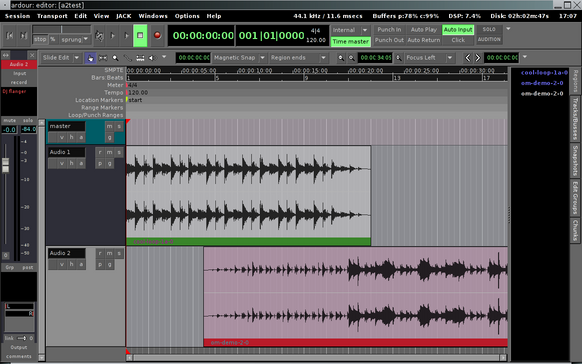 Ardour's feature set includes non-linear non-destructive region-based editing, unlimited undo/redo, full automation support, a very powerful mixer, and support for LADSPA and VST audio effects plugins. Ardour can be operated from hardware control surfaces (such as Frontier Design's Tranzport) and will synchronize to an external timecode source (e.g. SMPTE/MTC). The program is intended for fully professional application and is comparable to Win/Mac DAWs such as Pro Tools and Cubase. Ardour is much in the news these days. A new version of Ardour2 (beta 5.1) is now available, chock full of feature improvements and bug fixes. Experimental support for MIDI is included, thanks to Dave Robillard and the Google Summer Of Code project. Potential users should note that this release is still a beta version, and the developers need your feedback, so download it today and be sure to report your experiences to the Ardour mail-list. See the program's Web site for download and installation details. Some time ago Paul Davis, Ardour's chief designer, announced his involvement with Harrison/GLW, manufacturers of high-end pro-audio mixing consoles. The Harrison X-Dubber runs on Linux itself and uses Ardour for its primary audio editing suite. Now it seems that the buzz is reaching out through the industry: Solid State Logic (SSL), another respected name in the world of pro-audio technology, has announced its support for the development of Ardour. This support has profound implications, and perhaps it's not too far-fetched to predict that someday soon Linux audio software will permeate the professional audio world in the same way it has already reached the world of professional video production. At any rate, this news represents a great acknowledgment towards the terrific work done by Paul and his team. Kudos and congratulations to all of them, and cosmic thanks for one of the finest open-source projects I've ever used. And if that news wasn't enough, you can now purchase Ardour T-shirts! See the Web site for details, get 'em while they're still warm. I've had many occasions to mention Rick Taube's Common Music in various articles and columns here and elsewhere. In my opinion it is another one of the finest achievements in the world of free and open-source music software, and I agree with Charles Dodge's assertion that is a true generalized language for composing music with computers. Common Music can be used to make music of any sort, from rigidly determined to utterly algorithmic, allowing any possible blend along the way. If I had to reduce my audio/MIDI toolkit to only a handful of programs, Common Music would definitely be among the chosen few (along with Ardour and Csound5). Recent reports from the Common Music domain include news of support for the SAL syntax (no LISP experience necessary), an improved real-time scheduler (yes, Common Music does realtime output), and expanded Gauche Scheme support for Common Music's PortMIDI and MidiShare output targets. Btw, in case you don't know, Common Music's output targets include audio and MIDI via Csound, Common Lisp Music, and SuperCollider3 (realtime or deferred) and music notation via FOMUS and Common Music Notation. Finally, a site devoted to music made with Common Music is now on-line, thanks to David Kamp. Common Music is a member of the "Common" family of sound and music applications that includes Bill Schottstaedt's Common Music Notation, Common Lisp Music, and his amazing Snd audio editor. These applications share a common mail-list (naturally), so I'll add some of the noteworthy news regarding them. Snd is now up to version 8.4, and Kjetil Matheussen's Snd-ls has reached release number 0.9.7. According to Kjetil, Snd-ls is for people "... who don't know Scheme very well and don't want to spend too much time configuring Snd". Not that configuring Snd is all that difficult, but a little LISP goes a long way with it. If you're utterly LISP-ignorant and would like to use Snd you might want to try Kjetil's version first. Kjetil is a busy fellow these days. He is also responsible for a port of Radium, a module tracker originally available for the Amiga computers, and his version 0.61f now supports output to Common Music Notation. But wait, that's not all Kjetil's been up to: San Dsynth is his entry into the Linux softsynth domain, marking also the first appearance of a stand-alone realtime synthesizer written in Snd (yes, Snd also includes a language component). Snd has attracted the attention and labors of many developers (all of whom receive due credit in Bill's release notes). Given its radical extensibility (really, nothing compares to it) Snd has seen various interface and configuration improvements from users and developers. Most recently, Oliver Doaré has placed on-line his snd_frg.scm, a neat chunk of Scheme code that customizes Snd to work more like the popular Sound Forge audio editor. Bill Schottstaedt continually improves Common Lisp Music and Common Music Notation. New releases are not always reported to the list, but you may be assured that the latest versions are indeed fresh from the CCRMA Common kitchen. Over the past two years a massive amount of work has gone into Csound5, and in my opinion this version of Csound is simply fantastic. Its features list is a computer musician's dream come true: true re-entrance supporting multiple instantiations, an API for development of stand-alone applications utilizing the Csound engine, extended support for JACK, PortMIDI, and ASIO, a massive number of opcodes, integral support for FLTK graphics, and other features too numerous to list here. Version 5.03 is already cooked and ready, with 5.04 baking as I write. Installers are available for every supported platform, documentation has been thoroughly revised and updated, and an integral launcher-with-GUI has been added to the package. This Csound is truly a Csound for the 21st century. With all its recent additions and improvements, Csound can still be a bit daunting to newbies (and even sometimes to not-so-newbies). As a result, developers have written various front-ends and utilities for easier use of Csound. 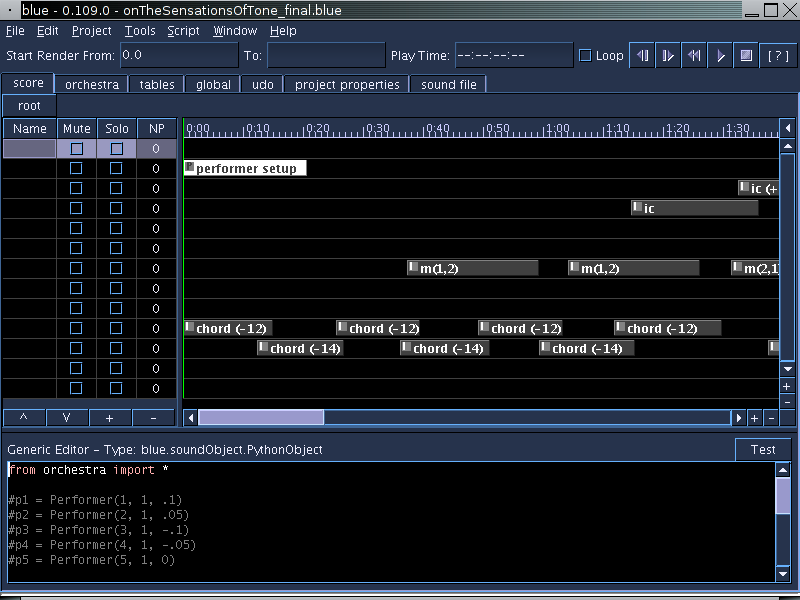 These programs range from more-or-less simple GUI launchers (such as the new csoundGUI mentioned above) to full-featured environments for composition and rendering. In this brief survey I'll mention some of the recent entries to the list of Csound helpers and extenders. Ben Collver has written a number of utilities for soundfile conversion, including mod2cs, a cool tool for converting MOD/S3M/XM/IT music module files to a format playable by Csound. Mod2cs is an extension of Ben's sfubar, a utility for creating and editing SoundFont2 files at the command line (btw, Csound includes support for using soundfonts). As mentioned, Csound now has a developer's API. Rory Walsh has written an Introduction to the Csound5 API, a handy guide for programmers who might like to augment and enliven their audio applications with Csound's considerable powers. Rory's own Lettuce is an excellent Csound file editor and demonstration of the new API in vivo. Lettuce is currently available only for Windows, but a Linux version is planned. Meanwhile, you can try running it under recent versions of WINE. Jean-Pierre Lemoine pointed the list's attention to TamTam, another application based on the Csound API. One of TamTam's special attraction is its inclusion with Nicholas Negroponte's One Laptop Per Child project. Integral graphics components have inspired an array of user-designed instruments. Andrés Cabrera's Diffamator is a nicely designed MIDI-controllable FM synthesizer, complete with storage for presets (requires Csound 5.02 or higher). Iain McCurdy has incorporated graphic controls into each of his Realtime Csound Examples, a large set of demonstrations of Csound5's various synthesis methods and signal processing opcodes. 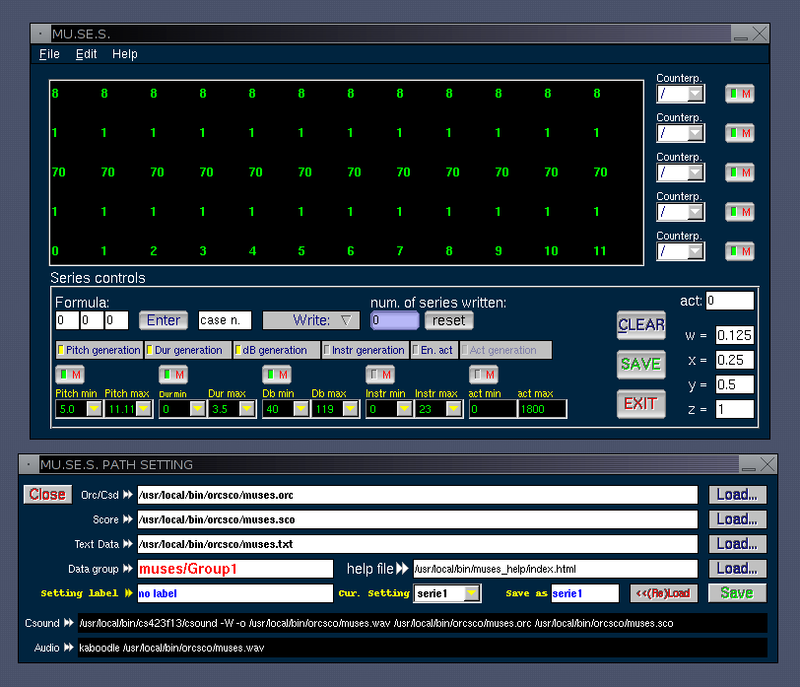 External FLTK widgets also provide the GUI for Luigi Negretti Lanner's Mu.Se.S., a unique Csound score generator based on series manipulations and permutations. Version 0.1.3 is style-neutral, easy to learn and use, and will run with either Csound4 or Csound5. Steven Yi's blue is a complete environment for working with Csound for both composition and synthesis/DSP. 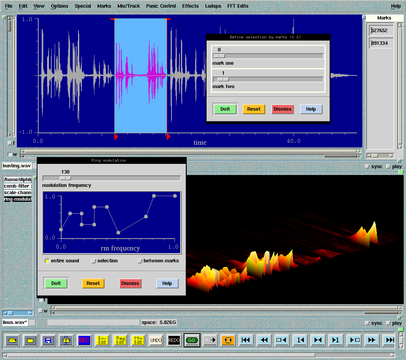 Many unique tools are provided, including soundObject widgets and a graphic timeline for composing an order of soundObjects. 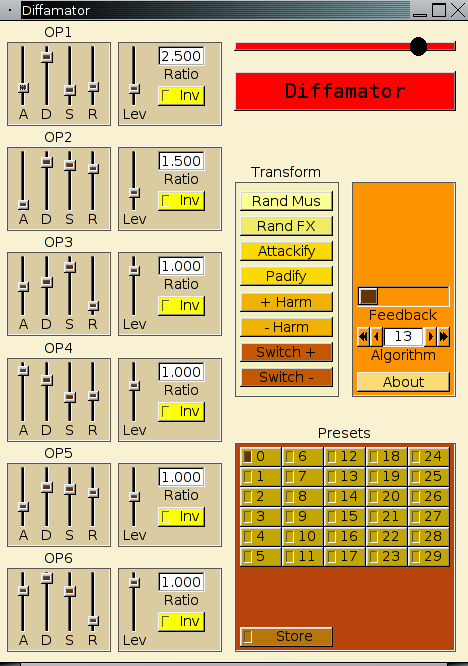 GUI components are available for constructing synthesizer interfaces, Scala tuning files are supported, and a piano-roll interface is provided for event entry (with or without microtonal capability). Version 0.109.0, the most recent blue, has added a tracker-style event-entry interface to its arsenal of composer's amenities. Volume 1 issue 4 of The Csound Journal is now on-line. The Journal was founded by Csound guru Hans Mikelson, but these days it's maintained by James Hearon and the apparently indefatigable Steven Yi. They continue to uphold the e-zine's original standards, and its content is well-presented, enjoyable to read, and always instructive. Csound 5.04 is waiting in the wings, and developer Victor Lazzarini tells me that a new version of Cecilia should appear Real Soon Now. Work on Csound continues to proceed at the more fundamental levels, thanks to the dedicated efforts of John ffitch, Michael Gogins, Steven Yi, and a host of other contributors. If you've wanted to get into it but were put off by perceived difficulties in installation or usage, perhaps it's time to take another look to see what's inside the latest Csound. It didn't make headlines, but it should have: James Tenney, American composer and educator, passed away on August 24th 2006. "Another man done gone, another man done gone... "
Check out the new stuff, and don't forget to make reports (and maybe some donations) to the authors. I'll be back in two weeks with more news from the world of Linux sound and music software. Ciao for now !